The first outdoor day of Green City Market in early May featured ramps, asparagus and other typical spring Midwestern crops. The market has one of the strictest sourcing policies in the city. 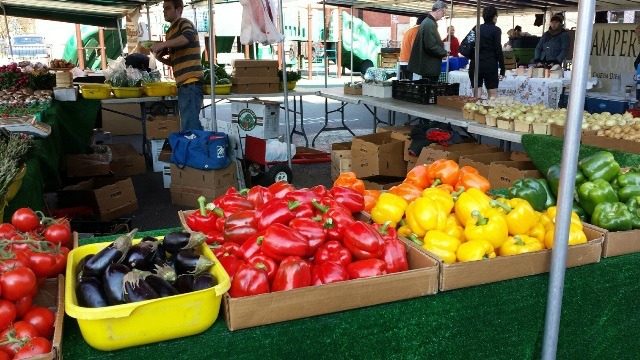 On a breezy Saturday morning in early May, shoppers bustled through the French Market in Lakeview stuffing their bags with brightly colored sweet peppers, plump tomatoes and deep purple eggplants. A couple of miles down the road, in Lincoln Park, foodies welcomed the year’s first outdoor Green City Market. But here, the pickings were much slimmer: just ramps, asparagus, greens, radishes and some cellared stuff from last year. Even as the the warm weather moved in last week, Michigan-based Klug Farms, was still only offering, “spinach, swiss chard, rhubarb, asparagus, herbs, lettuce, kale and potatoes,” said Klug salesclerk Jeremy Sapp, as he stood in Daley Plaza. So, with all the recent emphasis on seasonality and local food, why did one market look like it sold imported produce while another reflected springtime in the Midwest? It really boils down to different market philosophies. But it also illustrates the importance of knowing your market before you shop. The Chicago area will host more than 150 weekly farmers markets this year and they don’t all share the same priorities. Leslie Cahill, who manages 14 Bensidoun French Markets in Chicagoland, says these gatherings are more about nurturing new entrepreneurs, creating community and presenting unique products. So, she’s not so strict when it comes to local produce. Cahill said she has another vendor who imports fresh figs from the West Coast. And all she asks for is transparency. Still, local food advocate Roxanne Junge, who manages the Glenview Farmers Market, worries that some vendors won’t be so transparent. Yesenia Mota has managed City of Chicago farmers markets for more than a decade. And over those years, she says, the city has become much choosier about its vendors. At Green City Market, the process goes one step further. Not only does the produce need to be local. But each vendor must earn and display a specific sustainability certification. Most markets also allow co-ops or the ability to bring in produce from a neighbor as it’s vetted first. Then we’ve got the independent farmers markets. These can be located in the city or suburbs. But each is governed by a different set of rules. And, as long as people are honest, Junge says this diversity can be a good thing. This flexibility, for instance, allowed the independent Bronzeville Community Market to include decidedly “un”local oranges, bananas, broccoli, grapes and packaged lettuce when it opened in 2008 (it’s on hiatus this year). Bernita Johnson-Gabriel, who helped launch the market, says it wouldn’t have made sense to keep them out. So, why exactly is it so important for some people that the produce at farmers markets be purely local? For Cahill of the French Markets, however, the goals are a little different. And in some case, get to know your market manager, too. That way, you know what you’re buying before you start filling up your bag. No matter what kind of farmers market you attend this summer, there are some universal tips that can help make the experience better. Take an initial spin around the market and get the lay of the land before buying. Bring your own bags, including some insulated bags with cold packs if you’re taking home perishables. Be open to new produce, but also shop with the week’s schedule in mind. If you’re going to be eating out much of the week, for example, those 10 bags of arugula could be a mistake. Give yourself a budget. Between snacks, pastries, produce, cheese and meat, you can easily drop $100 without knowing it. If you have limited cash, figure out who takes credit cards and then plot your purchases from there. Figure out your priorities--organic, never sprayed, local, biodynamic, pastured, grassfed, heirloom--and then ask questions of the farmers based on them. But keep in mind that, for example, organic tree fruit farming is nearly impossible in the Midwest due to the humidity and the pests. Many fine farmers, instead, use integrated pest management which requires only the most crucial pesticide applications. Ask farmers (or chefs doing demos) for suggestions on how best to prepare unfamiliar produce. If you’re making pies or sauces (or you’re just not fussy) ask to see the box of “seconds” or cheaper, imperfect produce that farmers didn’t feel was fit to display on the table. Farm fresh pastured chicken eggs sell out fast and require you to get to the market early. And if you find a farmer with healthy egg yolks the color of pumpkins, it means the chickens get to live and forage outdoors. Return to that farmer often. Bring lots of small bills. Farmers love exact change and it speeds up transactions. Bring old yogurt containers to protect delicate berries and other produce on the trip home. Clear off the counters and take out the bowls and colanders before you leave for the market. This may inspire you to wash, process (and even eat) your produce as soon as you come home. Produce loses nutrients within days of picking, so the sooner you can eat it, the better. If you’re trying to go green, ride your bike to the market. Studies show that your chosen mode of transportation plays a big role overall carbon footprint of your shopping experience. If you are going to make a big batch of sauce or pies, call your farmers before the market and ask them to bring the “seconds” to the next market for you. — Janine MacLachlan. If you want to plan for future cooking projects ask farmers which crops are close to coming in, or more generally consult the city’s seasonality chart.